But what exactly is in season right now? Throughout February and March, broccoli and cauliflower are in season. As of March, lettuce finally gets that perfect crispness. But that’s it? Well….yes and no. Although these veggies don’t seem as if they can satisfy your deprived green needs, they definitely can. 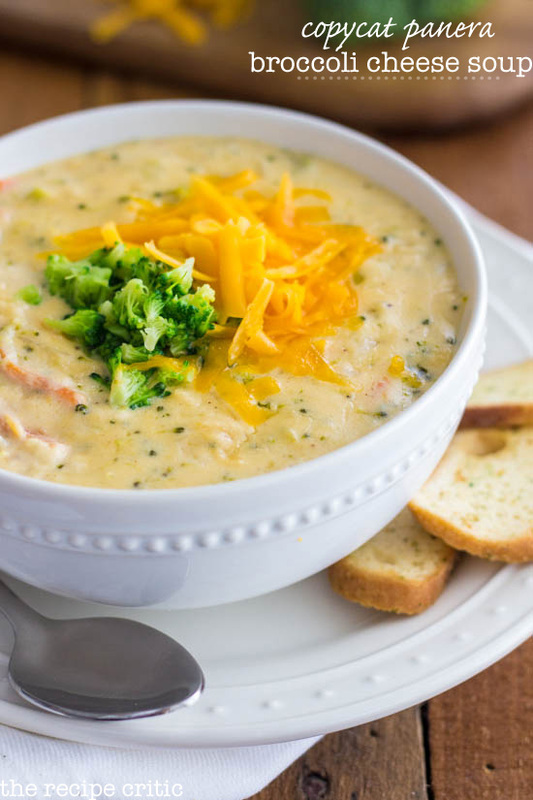 For the rest of us who live on the east coast and are getting hit hard with snow and ice this year, what can warm us up better than broccoli cheddar soup? You mean…just like… Yep! Just like Panera! This recipe from Alyssa on The Recipe Critic calls for 1 heaping cup of fresh broccoli and only takes 45 minutes from prep to inhalation (because who just sips their soup anymore?). I think what really gets me is that you won’t have to leave your house to get Panera’s creamy soup or have to pay $5.09 per bowl. This soup is perfect to get your broccoli fix and keep you warm in the bitterness of the winter. And who doesn’t love free seconds? Well, considering America’s new obsession over pizza, why not try a pizza with cauliflower dough? Sound odd? Probably. Look mouth-watering? Absolutely. This recipe from iFoodReal hardly tastes any different from original doughy pizza. But why would I even want to try that? Besides the fact you’d be using an entire head of incredibly fresh cauliflower, have you even thought about the health benefits? 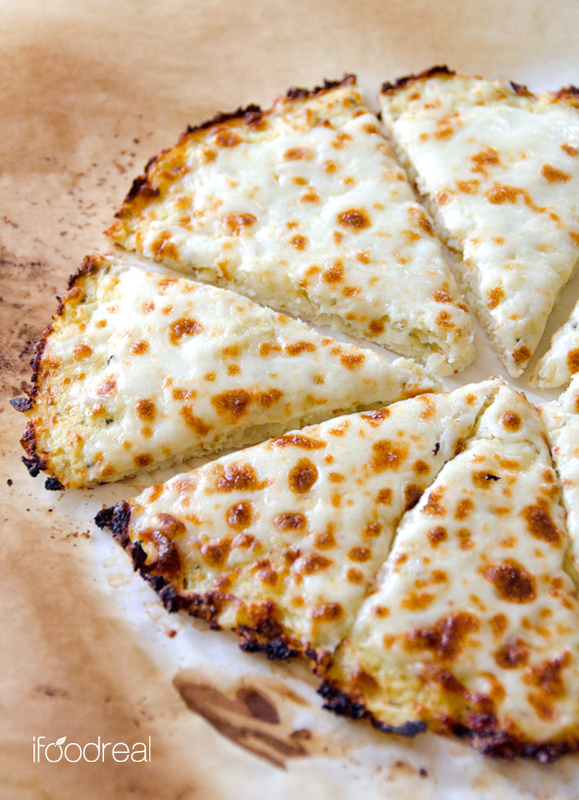 An entire pie of regular cheese pizza is around 2,269 calories and 294.8g of carbs while a cheese pizza with a cauliflower crust is around 510 calories with 5.6g of dietary fiber and 5.7g of carbs. So when you’re stuck inside from snow all day and get an itch for greasy pizza, instead of ordering out, try making a cauliflower pizza. It takes only a half hour from start to finish so how could you even turn down this healthy alternative? When it comes to lettuce, I know what you’re already thinking: vegetarian + lettuce = plain salad. But that’s not the case. 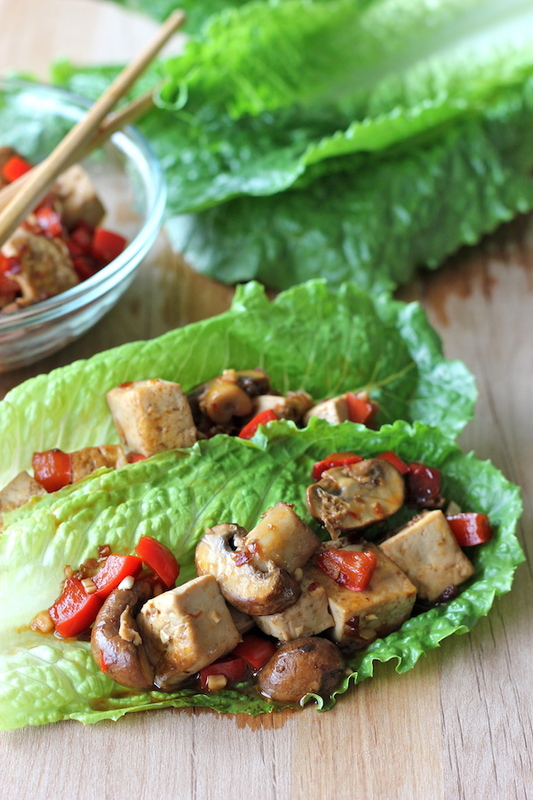 Ever try spicy tofu lettuce wraps? This recipe from Chungah at Damn Delicious kind of reminds me of grilled chicken wrapped in a tortilla, but this is much healthier (and obviously veg-friendly). For recipes similar to this, it’s vital that you use fresh, crisp lettuce so that your meal isn’t nearly as bland and un-enjoyable as it could be. So while you’re trying to lose a few extra pounds before spring break or prepping for your summer body, this is a great quick and easy meal to try that even non-vegetarians are sure to love! In March, pineapples and mangoes are finally beginning to ripen to their perfect juiciness. But again, that’s it?! Although fruit smoothies are delicious, they’re not always ideal for people (…like me) who don’t do well with cold, especially in the winter. So here are some other options for foodies who love fruits. 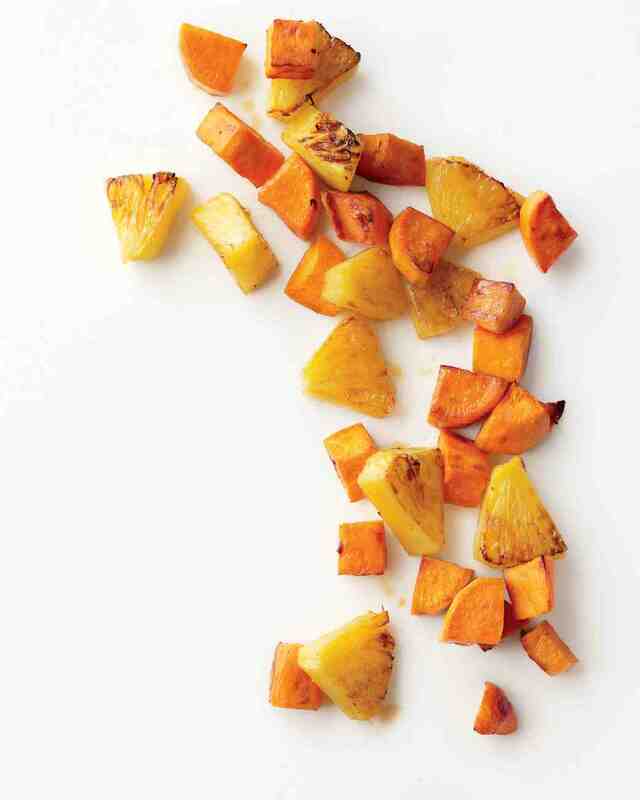 Nothing makes me happier than finding a new potato recipe, and this recipe for roasted sweet potatoes and pineapple from Martha Stewart is just dreamy. It calls for one entire fresh pineapple, cut into 1-inch pieces and two sweet potatoes for four servings. After taking only 30 minutes to cook, this recipe will make the perfect side dish to just about any meal. These super sweet potatoes are sure to give you just a little taste of summer while you’re bundled up for winter. 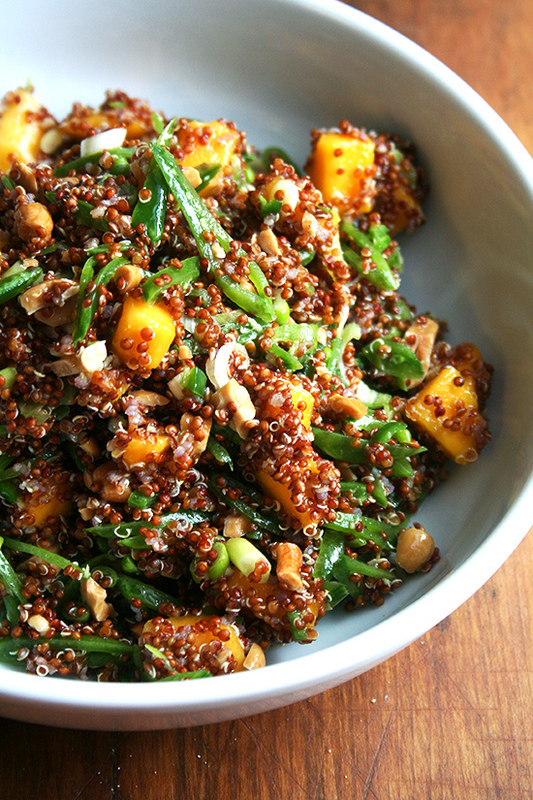 Lastly, this recipe from Alexandra Cooks for Quinoa Salad with Mango, Snap Peas, Ginger and Lime is perfect for your sweet tooth and would taste incredible with mangoes that are perfectly in season. But I don’t want to eat a salad. Well, it’s not entirely a salad. The typical lettuce is replaced for snap peas, quinoa, and scallions with the two cut and peeled mangoes acting as croutons. Now what about that screams plain salad to you? The entire recipe takes just about 15 minutes and suggests letting it cool and marinate for an hour in the fridge before serving, but if you just can’t wait after eyeing-down that beautiful bowl, I say go for it! So go ahead and search the grocery store or farmer’s market for the perfect fruits and veggies once March hits and pick out broccoli, cauliflower, lettuce, pineapples, and mangoes. But remember that you don’t have to make boring meals with these ingredients, either. There’s a lot more that can be created other than plain salads and smoothies; a vegetarian lifestyle doesn’t have to be boring.